Take heart if you are juggling work and school because you are not the only one. It gets even more difficult when you have a family to take care of. But you shouldn’t let time shortage make you drop out of school or give up on your job. How exactly can you stay on the right track? 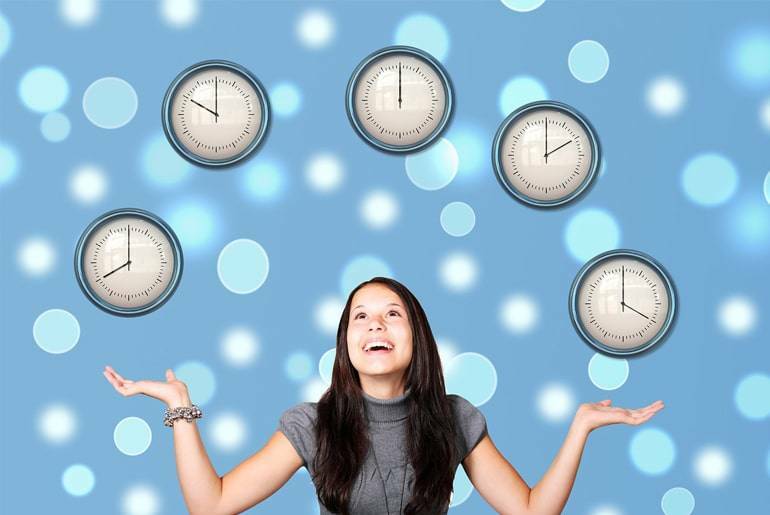 This post has some impeccable time management tips you could use. Time management for students has never been an easy task. Most of them blame lack of time yet they waste it doing unnecessary activities. Making a schedule goes a long way in keeping you on the right track. Consider this advice carefully and see what happens. Without a concrete plan for your day or week, it is easier to get sidetracked and forget important things. If you don’t prioritize your activities, you will end up getting overwhelmed and at some point, you will find yourself doing absolutely nothing. Planning is one of the most powerful concepts in life. But don’t just plan in your head. Write it down on a paper and keep it close. Having a schedule is one of the best time management strategies. It allows you to have an orderly life. You can divide your events into 30-minute chunks. Start by filling in mandatory activities like class attendance and working hours. Once you lay down the mandatory tasks, you will have a clearer idea of how to attend to other life responsibilities. This tip might seem so simple but it forms the basis of time management. Be sure to stick to your schedule to get the most out of it. You cannot work or study continuously. Sometimes, you need to relax and unwind by taking a long bath, strolling around the neighborhood, or simply watching a movie. Always take your time to rest so you don’t get into a burnout. However, there are times you have to forego rest. While you are entitled to happy moments in your life, you need the discipline to achieve your life goals. You cannot 6 hours of watching YouTube videos while the deadline for your term paper is fast approaching. Sometimes, you might need some extra money and you can devote your free time to working over-time. So, consider sacrificing your time to pursue your studies or a dream job. Procrastination is part of being human. We tend to do thing later than sooner. It is true that tasks are not always enthralling and they can be so overwhelming and boring at times. What do you do in such situations? Instead of doing nothing, why don’t you start with small manageable tasks? But if you keep postponing, anxiety will build up and you might just put off the tasks again. Sometimes, you might start doing other trivial stuff to deal with the guilt of procrastination but it doesn’t help. A procrastinator is a poor time manager. A few tips can help with time management for college students. Perhaps your college has introduced online classes but you haven’t checked them out. Online lessons could work best for your busy life and you’ll certainly have an easy time. Talk to your professor to see if you could complete your course at your own pace. Find all possible types of support to fit in your schedules. Don’t forget to talk to your boss too as s/he might offer support. Look for areas you can exploit your online working experience if possible. That way, you will be able to utilize your time more efficiently. You can only be in one place at a time. When you get to class, concentrate on what the professor is saying and avoid distractions. When you are done with a course, you will feel motivated to undertake another. But you don’t need to pressure yourself with too much work. If your degree takes 3 years to complete, don’t force yourself to graduate a year earlier. If someone else can do your tasks as good as you, why not delegate? There are a lot of unnecessary tasks like arranging your closet which you can have another person do them for you. After assessing your life commitments, talk to your family and friends and see how they can help. It is not easy to let go of some responsibilities sometimes such as taking care of your kid. But your current life may not allow you to do it all. Therefore, make good use of your spouse, brother, sister, or neighbor. Time management for students has always been a problem especially when their lives are cumbered with a load of responsibilities. It is time you stop lamenting how your busy life makes it hard to have a balanced life. Too bad, there cannot be more than 24 hours a day. But the truth is lack of enough time is not the exact problem. Poor time management is the issue. From today henceforth, start making the most of the available time if you want to succeed in life. Emily Watts is a professional life and career coach who has spent her last 15 years helping thousands of people create a balanced life especially working students. Emily works for Eduzaurus Plagiarism Checker. She is a fully certified executive coach with her own business that aims at transforming people’s lives. She has been interviewed for TV shows and lifestyle magazines. When not mentoring, she blogs about time management. « How Can I Improve My Career Prospects?